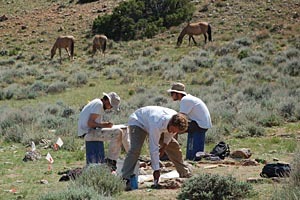 Archeology students excavate a tipi ring at Bighorn Canyon. The Bad Pass Trail runs for miles along the western side of the rugged Bighorn Canyon, in southern Montana and northern Wyoming, through Bighorn Canyon NRA. Bad Pass Trail has been traversed probably since the earliest human habitation of the continent. It brought people from the Bighorn Basin onto the plains of Montana, perhaps in seasonal rounds that took them to abundant bison herds beyond the mountains. "It's been used for 10 to 12,000 years," said Chris Finley, NPS archeologist at Bighorn Canyon. How did people across 10 millennia make their living in this high, dry, country between the Pryor and Bighorn mountains? Did they travel in small family groups and revisit the same sites season after season? Were concentrations of these stone circles evidence of a large seasonal gathering or do they represent smaller encampments over long periods of time? Did they stay a few days or dig in for the spring or fall? Bighorn Canyon NRA provides a unique setting to address questions about the people who lived in this area. The canyon country served as a natural travel corridor between the Bighorn Basin and the High Plains to the south and the unglaciated Missouri Plateau to the north for thousands of years. Who all of these people were, we may never know. But researchers from Indiana University, Bloomington, IN; Northwest College, Powell, WY; and Little Bighorn College at Crow Agency believe that some 300 to 400-year-old rings can be attributed to an early Crow presence in the canyon. Of the many indigenous groups who followed the Bad Pass Trail, the Crow still live closest to Bighorn Canyon and Bighorn Canyon lies at the heart of Crow territory. The Crows immigrated to the area as recently as the late 16th century. During this time, they were in transition from a semi-sedentary horticultural life to one as nomadic bison hunters. These changes brought about transformations in social and ritual life. Soon afterward, Crow Indians made contact with the first Euroamerican explorers. Impacts of 19th century culture contact and colonialism accelerated transformational trends in Crow life as they changed from a nomadic hunting culture with horticultural roots to a sedentary ranching and reservation-based lifeway. Domestic campsites in Bighorn Canyon bear witness to these transitions. Today, the trail consists of numerous rock piles or cairns, which once helped guide travelers along the treacherous canyon country. People also left behind traces of camps along the trail, including the rocks that once held down the bottoms of their tipis. "The nice thing about tipi rings is that most people don't pick up the rocks and take them away," said Laura Scheiber, an archeologist from Indiana University conducting her fourth field school on the park's Bad Pass Trail in 2008. She was standing on the edge of a park road amid circles of red, blue and orange survey flags flapping in a 20 mph wind. The flags mark some of the 35 tipi rings her students have mapped this year. Across the road, 60 more have been identified. As many as 1,000 stone circles within the park boundary require documentation and investigation under the current NPS archeological site condition assessment mandate. Students use GPS to locate and record each tipi stone and artifact. A field school that brought 19 undergraduate students and two graduate students from around the world to study the tipi rings on the southern end of the recreation area mapped every single rock on a site on the north end of Mustang Flats down to a fraction of a centimeter. The 2008 field school was the third annual in a research project to explore the historical and social landscapes of the Yellowstone ecosystem. Under the watchful eyes of their professors Scheiber and Judson Finley of Northwest College, students note, mark, map and learn how a field archeologist works. Ethnographer Kelly Branam of St. Cloud State University, MN, helps them interpret the social setting of the campsites and relate it to traditions of modern native peoples. Before they headed to the canyon, the students camped out on the Crow Reservation to learn stories and traditions and how the Crow have integrated into modern life. Using remote sensing technology, they have been able to identify hearths in some of the rings and will excavate the most promising for materials that can be carbon-dated. Finley says the NPS has paid to have four samples carbon-dated each summer. In 2007, the field school found a projectile point that dated to 8,500 years ago. Field school students map tipi ring at the Two Eagles site, Bighorn Canyon NRA. Stone circles aren't an exact measurement of the circumference of a tipi. When it was time to move, the rocks would have been pushed out and off the hides so the tipi could be wrapped for transport. “There is this idea that with the horse and their ability to carry heavier things than humans and dogs, that tipis got bigger,” Scheiber said. “That may be true, but so far we haven't seen complete correlation between time and size.” The oldest tipi ring found to date is actually largest in size. The ring from 2,500 years ago is about 21 feet in diameter. The later rings are 12 to 15 feet in diameter. 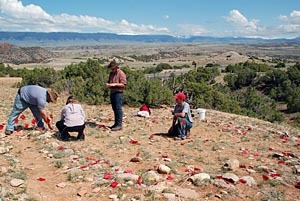 From “Students catalog tipi rings where ancient tribes lived” by Lorna Thackery, Casper (WY) Star-Tribune, June 12, 2008, with contributions from Laura L. Scheiber, Judson Byrd Finley, and Maureen P. Boyle, American Surveyor, April/May 2008. 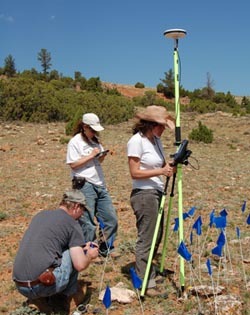 For more technical information about the survey methodology, read “Bad Pass Archaeology,” by Laura L. Scheiber, Judson Byrd Finley, and Maureen P. Boyle, American Surveyor, April/May 2008. <www.amerisurv.com/PDF/TheAmericanSurveyor_Scheiber-BadPass_April-May2008.pdf>. For more information about Bighorn Canyon NRA, go to www.nps.gov/bica/.